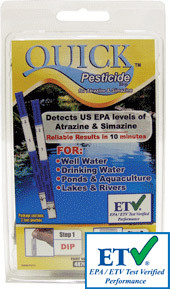 Quick™ Pesticides test strips for Altrazine and Simazine is an ideal at home or on-the-go water test for pesticides. Ideal for well water testing, or routine home water tests. Safe, reliable test strips, no technical training is required. Color coded results. Test uses immunoassay (lateral flow) test strip. Designed to detect both the US EPA limit of 3 ppb (μg/L) for atrazine and 4 ppb (μg/L) for simazine, Pesticide Check is a cost-effective alternative to expensive laboratory testing. Each strip offers two tests. Simply dip solution in water, take the strip out, wait 10 minutes for the colors to develop. Excellent test for Well Water, Drinking water, ponds and aquaculture, lakes and rivers.